Crazy for Crypto? Don’t Get Burned Like Me! Like many others, I was curious about the cryptocurrency craze. I wanted to know more about Bitcoin and how to invest in it, but I didn’t know where to turn. Last year, one of my family members made over USD 200K off a Bitcoin investment. Plus, a friend of his made over USD 900K in the same time frame trading Bitcoin and new cryptocurrencies. When I asked them what their secret was, they said, “dumb luck”. Bitcoin took its largest jump just a few weeks after they bought it, and they were both smart enough to grab their money and get out. Unfortunately, investing in any cryptocurrency is just like gambling. Be wary of investing money you can’t afford to lose. And this is especially true if you buy it with credit cards. Many banks in Canada and the US won’t honour cryptocurrency credit card purchases. Canadians who want to use their TD Bank credit cards to purchase cryptocurrency are out of luck. Toronto Dominion Bank just announced that they would no longer allow this. In the US, Capitol One blocked their customers from using their credit cards to buy Bitcoin. Citigroup and Bank of America still allow purchases, but they are revisiting their policies, so this might not last. If you want to buy cryptocurrencies like Bitcoin, Ethereum, Litecoin, and others, do your homework. If the bank that issued your credit card won’t verify your purchase, the transaction won’t go through. Why Are Banks Prohibiting Cryptocurrency Credit Card Purchases? According to the Wall Street Journal, 18% of Bitcoin purchases are made with credit cards. Of these, 22% don’t pay off their statements. They often wait until the price of the cryptocurrency rises and say they’ll use this profit to pay off their debt. Banks worry that people will purchase more than they can pay back and that if the value of the cryptocurrency drops, they won’t have enough money to cover their credit card debt. If you decide to make a purchase, Coinbase, a widely used currency exchange accepts Visa and MasterCard for a 3.99% fee. Bitstamp and CEX IO do as well. If you want to use an American Express card, try going to Coinmama (however they charge a 5% transaction fee). You should also know that American Express limits cryptocurrency purchases to $200 a day, and $1,000 a month. Bitcoin’s value has increased over 300 percent since the start of 2017. In the middle of December 2017, it was valued at over USD 19K per coin. However, just a few days after it peaked, it dropped below USD 14K. Today (3 months later) it’s down to USD 10,670. If you bought at the top, you’re hurting today. Welcome to the world of crypto volatility. Purchasing any cryptocurrency comes with risks. Many have made a lot of money, and many have lost a lot of money. When considering a purchase, only invest money you can afford to lose. I must admit that after my relative made so much money on Bitcoin that I decided to invest a small amount myself. My husband advised against it (he trains executive bankers in negotiation strategies and is on the faculty of two renown US banking schools). But, I didn’t listen, and as it turns out, I wasn’t as lucky as my family member. To this day, I’m still waiting to recoup my losses. Who knows how long I’ll need to wait, or if I’ll ever get this money back. Don’t get burned like I did. The main feature of cryptocurrencies is their anonymity. I don’t think this is a good thing. The Government’s ability to find money laundering and tax evasion and terrorist funding is a good thing. Right now, cryptocurrencies are used for buying fentanyl and other drugs, so it is a rare technology that has caused deaths in a fairly direct way. I think the speculative wave around ICOs and cryptocurrencies is super risky for those who go long. He believes that these markets will eventually be shut down. However, he did reveal that his daughter invested in Bitcoin. The government is concerned about manipulation of market conditions and injection of illegal funds while market funds are leaked into speculative investments. We view that foreigners’ and minors’ investments contribute to our areas of concern. Much of South Korean’s concern stems from the fact that Chinese investors have flooded their cryptocurrency market since China banned cryptocurrency trading. The digital coins from China enter Korean exchanges where they are illegally changed into foreign currencies and sent back to China. This hasn’t stopped Chinese investors from trading in cryptocurrencies. Hundreds of millions of dollars were raised in the banned Initial Coin Offering (ICO) market. It seems Chinese investors are buying cryptocurrencies in offshore accounts and investing them in start-ups. They do this to bypass the rigorously regulated capital-raising process required by venture capitalists or banks. Over USD 3.2 billion was raised via ICOs in 2017. The good news is that the ICO industry is working to develop standards for a compliant framework for their projects like the SAFT (Simple Agreement for Future Tokens) to help navigate US laws. Even though the Canadian banks are trying to shut down bitcoin trading (at least via credit cards), Canada is quickly becoming a powerhouse for Bitcoin mining. Several regions across the country such as Quebec, Manitoba, and British Columbia have all seen an increase in attention from Bitcoin mining firms. This is the infrastructure of Bitcoin. Miners use computing power to identify a sequence of data called a “block.” But it’s relatively useless until they use a Bitcoin hash algorithm (a converter) to match a block, where they then receive a particular number of bitcoins. The Bitcoin hash that’s created is stored with the block at the end of the blockchain where it validates the block and the transaction. According to an article in Forbes Magazine, ICOs may be cooling down, but cryptocurrencies are here to stay. Worries about China’s banning of trading has put a damper on the ICO market. But this isn’t keeping the blockchain and crypto community at bay. There are other ways to make money on cryptocurrencies – funds for example. Coinbase recently launched an index fund for digital currencies. 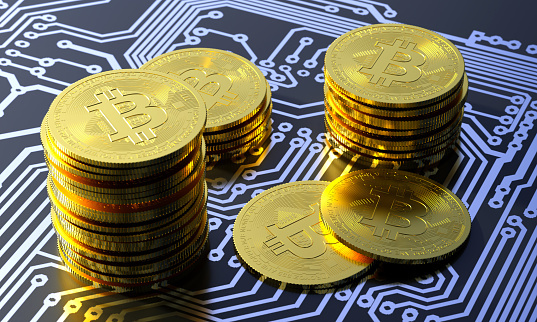 Ameritrade and other trading sites offer cryptocurrency funds like GBTC (Bitcoin Investment Trust). Is the product legal? Is it subject to regulation, including rules designed to protect investors? Does the product comply with those rules? Is the offering legal? Are those offering the product licensed to do so? Are the trading markets fair? Can prices on those markets be manipulated? Can I sell when I want to? Are there substantial risks of theft or loss, including from hacking? Don’t be like me and get burned by the Crypto Craze. Do your research first and take a deep breath before “jumping into the trading pool”. As you can see, it “ebbs and flows” from many underlying currents.